What are you going to find if you dig deep enough? Archaeologists dig in layers of the earth's crust for clues to our past. Ancient people and civilizations didn't have cameras and computers for storing records of their exploits. Instead they built statues, drew on walls, and otherwise left accounts of their deeds that literally were buried by the steady march of time. Students of the Bible know, for example, that archaeologists have found countless items that verify the once-challenged historical accuracy of Scripture. From the discovery of the Hittites to an Assyrian record of King Hezekiah to the Dead Sea Scrolls, archaeology has been a consistent friend to faith. Since late spring of this year, some archaeologists have been excavating two 19th-century outhouses in California. As workers were excavating to build condominiums and a parking garage, they found some things that were curious enough to make them call in the researchers. It turns out they had uncovered two 130-year-old toilets. Considered a veritable treasure trove by the scientists, construction is still halted as they do their careful digging. They admit it requires putting up with a lingering odor in the soil but consider the work both exciting and important. So far they have brought out a Bowie knife, a pistol, and some whiskey flasks. They have even unearthed a set of false teeth. "The further you go down, the stronger the smell," says researcher Marisa Solorzano. "But it's not that bad. These privies are archaeological gold mines." There you have it: a perfect illustration for how real life often works. Truth isn't always apparent on the surface of things. First impressions of people are often wrong. Situations that seem hopeless aren't. Relationships that appear to have broken down irreparably haven't. A man I was just getting to know tried to take his life a few days ago. He was convinced the smelly hole he had dug for himself and his family could only be his grave. He isn't the first person to take darkness, stench, and nastiness as their justification for quitting. Giving up. Or, pardon the pun, flushing everything. 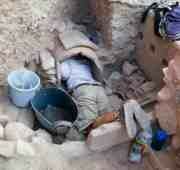 Others have found that what archaeologists know in their work is true of life in general. When you are in dirty and smelly situations, treasure may yet be found! There is a healthy sense of pride that comes to people who work to sustain their business through a turbulent economy or upgrade a product or service to meet new demands. People who work through an affair or forgive some other serious grievance to heal a broken marriage learn the meaning of grace. Pain, anxiety, and loss are never pleasant to endure. "The testing of your faith produces endurance," says the Bible, "but let endurance have its full effect, so that you may be mature and complete, lacking in nothing" (James 1:3-4). Valuable things come with big price tags. "Treasure in Toilets" by Rubel Shelly is licensed under a Creative Commons License. Heartlight encourages you to share this material with others in church bulletins, personal emails, and other non-commercial uses. Please see our Usage Guidelines for more information.